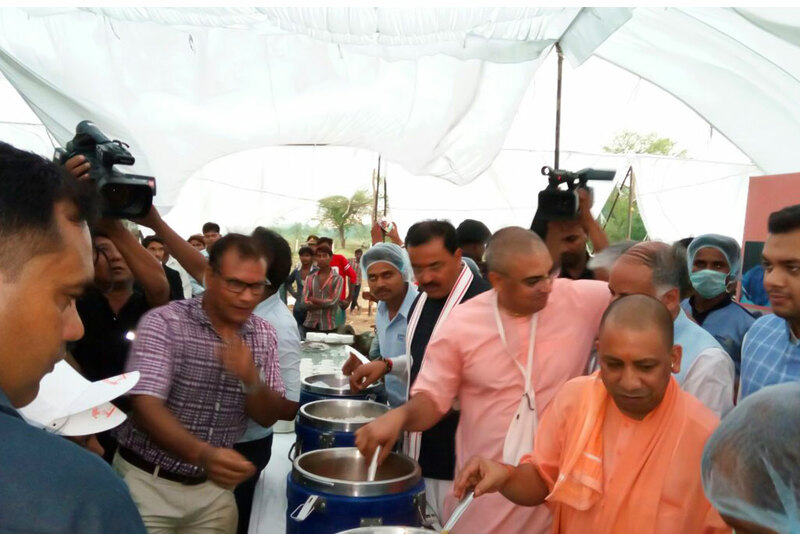 On July 1, Akshaya Patra had the pleasure of serving food to Shri Yogi Adityanath, Chief Minister of Uttar Pradesh. His visit was part of School Chalo Abhiyan and Vanutsav programme conducted at Lucknow. It was organized by Basic Education Department and Forest Department of UP Government. At the event, he served food to some of Akshaya Patra beneficiaries. The Chief Minister appreciated the quality of the food served by Akshaya Patra as part of the School-lunch Programme. Akshaya Patra is currently serving meals to 2,11,680 children from 3,021 schools. The Foundation will soon launch 11 new kitchens in the state which will be set up in different districts of the state like Varanasi, Ghaziabad, Agra, Allahabad, Kanpur, Etawah, Kannauj, Ambedkar Nagar, Azamgarh, Rampur and Ballia. This will enable us to serve over 1.3 million beneficiaries every day in the state, making this the Foundation’s largest intervention in India.